The Great River Road Month is here! September is Drive the Great River Road Month, which celebrates fall travel and Americaâ€™s greatest drive. Key chains were recently sent to our interpretive centers as giveaways in commemoration of Drive the Great River Road Month. Early reports indicate the key chains are popular items in our interpretive centers. Thereâ€™s still time to spread the word about this yearâ€™s Drive the Great River Road Month â€“ on the MRPC members website you will find 2015 resources, including a Drive the Great River Road Month logo, story ideas, itineraries and more. 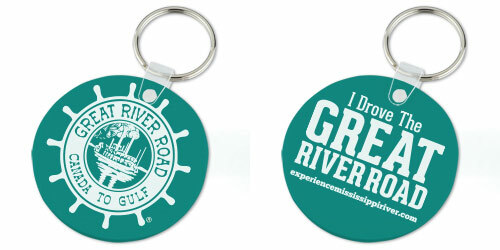 In conjunction with Drive the Great River Road Month, weâ€™ve launched the Drive the Great River Road Month Sweepstakes. The sweepstakes, which gives travelers a chance to win a $500 prize, promotes Drive the Great River Road Month, publicizes interpretive centers and aims to increase fan numbers and interaction on the Great River Road social media channels. The sweepstakes runs through September 30, and so far the promotion is generating strong participation. Postcards were distributed to interpretive centers to help promote the sweepstakes. The Great River Road Shop is open! We recently launched the Great River Road Shop. This online store gives travelers and fans of the Great River Road an opportunity to commemorate their experience with something special. The shop features apparel, bags, drinkware and more. Browse coffee mugs, hats, car magnets, T-shirts, tote bags and other souvenir items. There are some great items in the store. Check it out! The 2015 MRPC Annual Meeting in New Orleans is fast approaching. The meeting will take place Oct. 6-8 in the Maison Dupuy Hotel, and a special MRPC guestroom rate of $149 per night is available until September 8. Call 504.586.8000 or 800.535.9177 and ask for the MRPC group rate. Early-bird meeting registration pricing is available until September 18. Reserve your spot by completing and submitting a form and fee payment. Registration details are available online at mrpcmembers.com/meeting. Weâ€™re looking forward to seeing you in the French Quarter! A draft of the new Three Year Strategic Plan is online. The plan is the result of work completed by the Board of Directors during the Semi-Annual Meeting in St. Cloud. During the upcoming Annual Meeting, technical committees and the board will review the plan as it moves forward. The plan outlines objectives, goals and strategies that will help us chart a strong course forward.